Racetech is proud to launch it's new range of engine pre-heaters designed in conjunction with our technical partners and developed with the feedback from leading historic motorsport teams. These engine pre-heaters allow a competition engine to be brought up to temperature without the need of running the engine, thus reducing the wear and running costs. Some competition engines also have such fine tolerances on their manufacture that they will not run cold, therefore a engine pre-heater is essential. 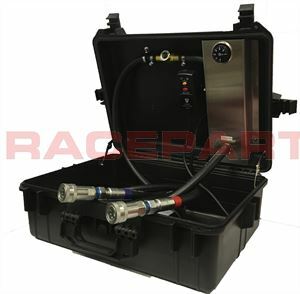 Available for cars with engines up to 3ltrs the Racetech HeatBox engine pre-heater can be used for a wide variety of applications. The 3ltr version now comes with Aeroquip fittings (the same type as used by the older Kenlowe design). Please note that until recently we did offer a 2ltr version however this is no longer available due to lack of demand. To view the user manual for the Racetech Heat-Box please click the 'Downloads' tab. If your application is more specialised then please call or email with details of your requirements.